LED Lighting will continue to grow in my opinion and become a greater and greater part of how we light things in the cine/docu/photo world. To date a major limitation has been power… most LED cannot output enough light to fight daylight. But as you’ll see in the upcoming year or two – that barrier is about to be breached. That makes things very interesting as we will need to rely a bit less on hot lights (literally burning hot lights) as well as generators as many of these lights can be adapted to work of batteries such as the Anton Bauer Dionics all the way up to the big Anton Bauer "lunch box." Litepanels has recently released two new lights that are pretty cool for filmmakers. The first is the Sola 4, which is the younger sibling to the Sola 6, a DMX controllable light, with an embedded touch screen. And while the Sola 4 does not have the touchscreen control, it does have DMX input for control from a lighting board which can make this a pretty versatile tool especially if you don’t have easy physical access to the light. What I find of particular interest for filmmakers is that they are fresnel lights, which are a staple of Hollywood and the film industry. They are named "fresnel" for the lens that the lights have at the front of their casing. This lens provides a uni-directional source that can be more accurately controlled than say the 1×1 Series lights, which are less controllable in terms of how focused the light is. A significant improvement over traditional fresnel lights is of course the fact that these lights are LED – so they don’t get incredibly hot. A Traditional 1k fresnel pulls 1000W of power out of the wall, and outputs an equivalent amount. 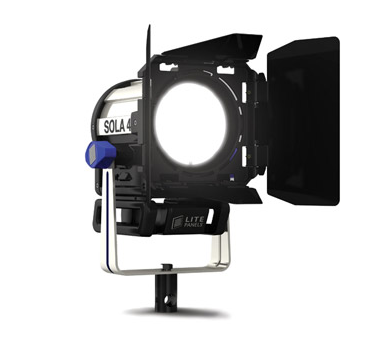 The Sola 4 pulls just 30W from the wall, and outputs up to 300W (the Sola 6 is 75W/650W). You can also dim these light from 0 – 100% brightness, which is not possible on traditional 1k fresnels unless you have a separate ballast. Therefore these lights give you a pretty incredible level of control relative to traditional lights. The other light is called the Croma. This light appears to be an evolution of the MicroPro. Like the MicroPro it is either stand- or camera-mountable, can be run off AC power or AA batteries, draws 9W of power, and outputs approx. 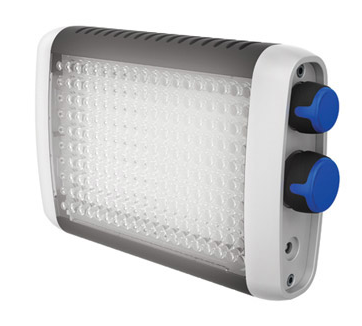 50W of soft LED light. The added advantage of the Croma is its adjustable color temperature (like the 1×1 Bicolors) – from 3200 to 5600 degrees (tungsten to daylight). Also like the MicroPro, this light seems to be most valuable to documentarians or photojournalists in run n’ gun shooting conditions. However, with the aid of the Croma, they will now be able to adjust the temperature of their camera-top light so that it can match the ambient light and look more natural. I’m not as in love w/ the design of the Croma as I am with the MicroPro (it’s built like a tank – or a brick to be more accurate) but the ability to adjust color temperature is a big plus… to some AAs may also be welcome. Like the MicroPro it does have a 1/4-20 mounting port on the base of the unit. I can’t imagine what Litepanels was thinking when designing the Croma. It would look great on the shelves at Brookstone or better yet in the “SkyMall” catalog found in the seatback of your favorite air carrier, but I would never consider it for my shoulder rig. I wish someone would design an “On Camera” light with the simple elegance of (for example) the SmallHD DP6 Monitor – a black brushed aluminum casing with solid 1/4 20 connection points and a quality battery mount. China CN160 – The light output is decent, but the Hot Shoe mounts are cheap plastic. The light is super inexpensive, but I wanted something more professional. CN240 Bi-Color – The Bi-Color is nice, but you’re only using 1/2 the LED’s at any given time, (it can never be both at full power). The Hot Shoe Mount is an improved metal one, but the Battery Mount is gimpy – you cannot use the large Sony NPF-930’s-970’s batteries because the connection isn’t solid enough – as you move around the light flickers as the battery loses contact slightly. My Sony NPF-930 (4,400mAh) fully charged (which will run my CN240 for 24 hours straight) lasted all of 14 seconds on the Switronix! The TorchLED Bolt requires more power than these batteries can deliver (I tried two different ones). I suppose if you purchase Switronix’s Powerbase 70 you’d have enough juice for this light, but the additional $400 expense as well as the inconvenience of rigging it all up on my shoulder mount is a bit too much for me. I don’t know where people are getting their information on leds, but leds do come in CRI of 90+, leds do come as single emitter designs in upwards of 5K lumens, leds do come in efficacity figures of well over 125 lumens per watt, a couple of lighting class leds of over 85 CRI (typically 90) at 3000K with the proper TIR (total internal reflection) optics will draw LESS than 40 watts and output well over 8000 (that’s thousands)lumens@3ft. That’s only with 2 leds and not them panels of 512 or 1024 teeny weenie bluish/low cri/spotty ones. Please people, read up a little more on leds before you knock them down. even arri led’s have cri ( color render index)= 80, tungsten about 99. Led’s are very poor choice if you want to shoot in color. Any changes as far as CRI is concerened? What is the highest CRI a LED fixture can produce in the present? Hey Vincent, do you think that LEDs could eventually become the standard for lighting on Hollywood sets? what would you say are the very basic central litepanel lights for a beginning director to have? anyways THANKS FOR ALL THE CONTENT! All the best! Exciting! I can’t wait for an opportunity to work on a show using LED lighting. I agree that it’s the future, but I think fluorescents will always have a place alongside LEDs. They might get cheaper as LEDs become more mainstream and tungsten lights fall out of use. The advantage of the LEDs, in my eyes, is not just that you can tune color temperature but you can create color as well! I remember a video demonstrating Arri LED fresnels that had selectable color dialed in using RGB values. Really saves money on gels and gives you more options. how u been – i just saw the film u shot with the new canon c300 ..
am interested to buy one – please can u let me know .. where is the best place to order from – is it filmtools – bn h ..
am been using the 5d mark 2s and been very happy with the results ..
Good to see real expertise on display. Your corintbution is most welcome. I use a Lowell Blender as an on camera light, powered from an AB battery. It also works well as a hair or background light for interviews off of mains. Pretty sturdy and you can dial the K in. Just got off the phone with LitePanels. Thinking of bringing one in for the shop. They say to use Dionic HC batteries. I asked if any Anton Bauer will work and they said yes, but HC gives you longer run time. I said “What, 24 hours as opposed to 36 hours run time?” The thing is 9 watts. Also – Texas Media Systems will be selling the Canon C300. An outstanding share! I have just forwarded this onto a coworker who had been conducting a little homework on this. And he in fact ordered me lunch simply because I found it for him… lol. So let me reword this…. Thanks for the meal!! But yeah, thanks for spending time to talk about this matter here on your blog. My pleasure! Hope the meal was good!